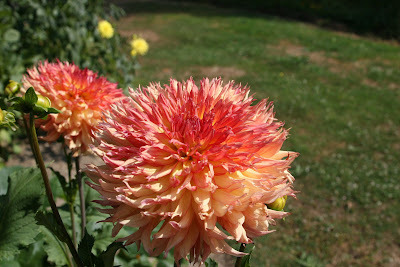 Yesterday I went to the Puget Sound Dahlia Associations first bulb sale of the season. 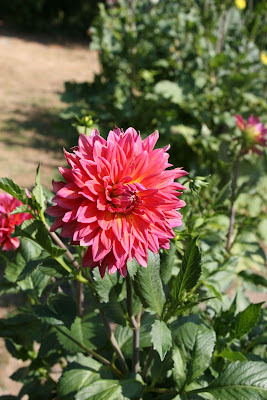 I found 34 dahlia bulbs that I needed and took home and many more that I wanted but didn't buy. Every year I have to remind myself that all the bulbs I accumulate in the early spring need to be planted before they spoil. Remember I acquired a few at the Northwest Flower and Garden show in February. This season, I'll have about a 100ish dahlia bulbs which will provide beautiful flowers from June until the first hard frost in the fall. Here are a couple of flowers from last year's garden. Seattle Tilth's Edible Plant Sale!